Imagine if the classic games The Lost Vikings, Lemmings, and Super Mario World were thrown into a blender. The result would be Rolando, a cute and clever puzzle platform game starring little tomato-like creatures called Rolandos. The object of the game is to get as many of the Rolandos in the level to the exit as you can, using the iPhone or iPod Touch's tilt sensor to move them. You swipe over the Rolandos to select them, then sweep upward to make them jump. 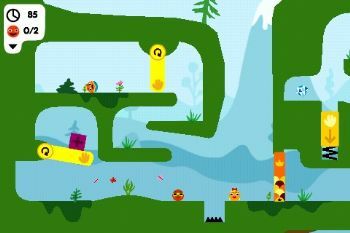 Yellow objects in the level like platforms and windmills can be moved, and the puzzle physics gets tricky after only a few levels. If you're having trouble picturing this, check out the trailer. There area lot of cute little touches. The king Rolando is huge and asleep, and you've got to get him to safety. The prince Rolando is a maniac and won't stop moving. As you unlock levels, the Rolando intro screen opens up like a puzzle, creating a little mini game-within-a-game.